Local bicycling enthusiasts are asking residents to be mindful of others on the road after two cyclists were hit -- one of them fatally -- yesterday in separate accidents on Oahu. Police are looking for a truck that struck and killed an 18-year-old man who was either walking with or riding a bicycle near Wahiawa early yesterday morning. A few hours later, a bicyclist in his 40s was struck in Ewa Beach, leaving him in critical condition. The teenager who died was the third fatal hit-and-run case of the year, and the second bicyclist to be struck dead in a traffic accident. Police are looking for a truck that struck and killed an 18-year-old Wahiawa man, Oahu's third hit-and-run fatality this year and the second bicycling traffic fatality. Both crashes happened before dawn, one bicyclist is dead and another is fighting for his life. About 1:30 a.m. yesterday, the teenager, identified this morning as David Wayne Aldridge, was walking with or riding a bicycle headed toward the North Shore on Kamehameha Highway in front of the Dole Plantation. Police said the truck, thought to be red, was traveling in the same direction when it hit Aldridge and kept going. Aldridge was initially taken to Wahiawa General Hospital in critical condition, and later transferred to the Queen's Medical Center where he died several hours later. "We don't know why he was on the road at that time, whether he was walking the bike or riding the bike," said police Sgt. Kim Buffett. "We're looking for witnesses." Police said the truck should have extensive front-end damage from the collision. "If a family member sees extensive damage and you see it parked in the driveway, or repair shops who are taking it for repair, call it in," Buffett said. The fatal crash was followed three hours later by another serious accident involving a bicyclist. About 4:30 a.m. yesterday, a bicyclist in his 40s was hit in the center mauka-bound lane of Fort Weaver Road, just before Keaunui Drive fronting the Hawaii Prince Golf Course in Ewa. The man was struck from behind by a mauka-bound van driven by a 40-year-old Ewa woman. The victim was taken to the Queen's Medical Center, where he remained in critical condition. The driver stopped in the second accident. Aldridge is the third hit-and-run fatality and second bicyclist traffic death of the year. About 9 p.m. June 4, 79-year-old Bonifacio Libosado Sr. of Honolulu was crossing Dillingham Boulevard outside a crosswalk when he was struck by a light-colored sport utility vehicle, causing him to fall into the path of another vehicle. He died hours later at the Queen's Medical Center. Police are still looking for the suspect vehicle, which was described as having paper dealer license plates. The other bicycling fatality also occurred last month and is the second fatal hit-and-run case. About 9:48 a.m. June 17, 63-year-old Kenzie G. Thompson of Kaneohe was riding on the sidewalk near Kamehameha Highway and Pua Inia Street in Kaneohe. A Ford Thunderbird veered off the roadway, onto the sidewalk and struck Thompson from behind. The driver, an 85-year-old Kaneohe man, continued driving north before being arrested minutes later, police said. The driver was booked on suspicion of failure to render aid, but has been released pending further investigation. Yesterday's death also marks the 29th traffic fatality on Oahu this year, compared with 41 this time last year. 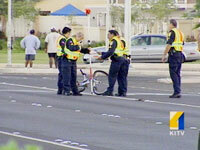 In all of 2007, two bicyclists died on Oahu. The Hawaii Bicycling League reminds residents to be mindful of the road, and for cyclists to wear protective and reflective gear. Police did not know if either cyclist was wearing a helmet or had reflective gear. "It's especially relevant now that people are taking to the streets more to save on gas," said Mitchell Nakagawa, the group's executive director. Seattle and San Francisco recently began a multimillion-dollar effort to make the cities more bicycle friendly, the league said in a written statement. "Kokua in helping put an end to these tragedies that affect our keiki, friends and family members by contacting your local public officials and supporting those who will implement changes," Nakagawa said. Mitchell said the group will be holding a Ride of Silence tomorrow starting at Honolulu Hale at 3 p.m. Riders are asked to wear a red or black armband. 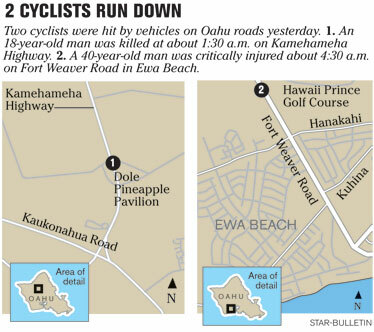 A 40-year-old Ewa woman driving a van struck a 35-year-old bicyclist on Fort Weaver Road Tuesday morning. Originally, this article incorrectly reported the driver was a man.